Canada’s Liberal party projected majority winner over Harper’s conservatives. 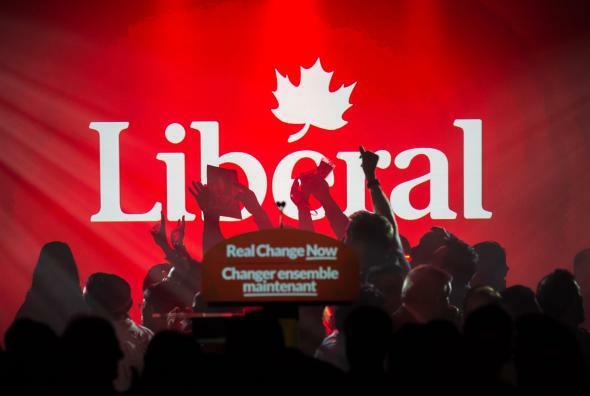 Supporters of Canadian Liberal Party leader Justin Trudeau cheer as results show the Liberals ahead in the general elections in Montreal on October 19, 2015. Canada’s three major broadcasters are projecting Canadian Prime Minister Stephen Harper will not retain his post and Justin Trudeau’s Liberal Party will take power for the first time in nearly a decade at the helm of a majority government. The polling throughout the 78-day election campaign has been extremely close for the country’s three major parties. Trudeau’s party, however, grabbed the lead in the days leading up to Monday’s vote and its gains appear to have come at the expense of the third major party, the NDP, which runs to the left of the more centrist Liberals. A party needs to win 170 districts to claim a majority. Trudeau’s victory marks one of the biggest political rebounds in Canadian history. The Liberals become the first third-place party to win an election, and the party’s seat gain may be the biggest ever. The Liberals, who governed for about two-thirds of the 100 years before Harper came to power, won just 34 districts in the 2011 election, the worst result in their history. Justin Trudeau, the son of former prime minister Pierre Trudeau, would be the second youngest prime minister in Canada’s history.